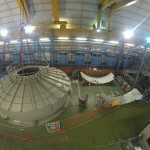 After seven days of hard work the support structure for the XENON1T cryostat has been finished this month. 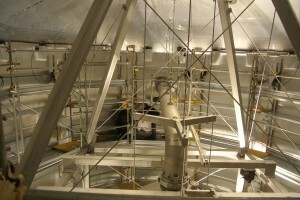 The photo shows this support structure which sits inside the massive water tank. 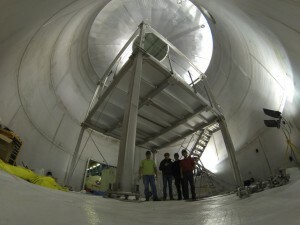 A total of 8.5 tons of steel with an ultra low radioactive background have been used for this construction. 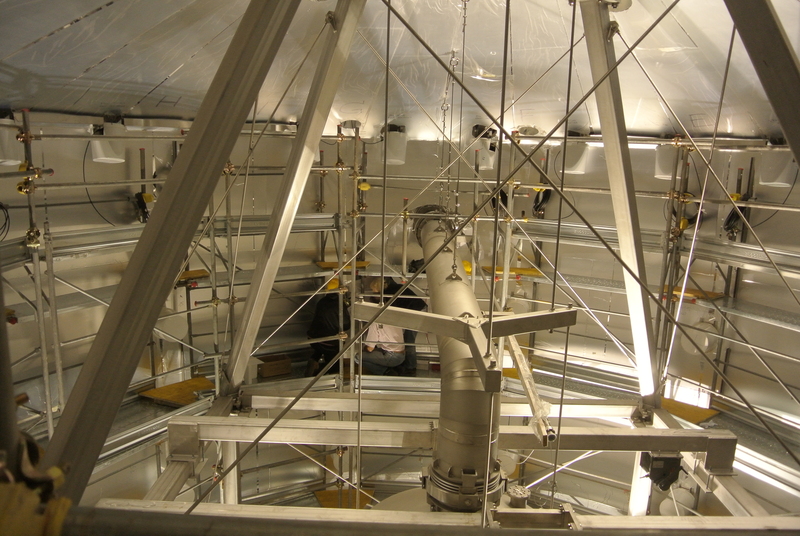 The cryostat vessel, weighting itself one tonne not counting the xenon, will hang inside this support structure. 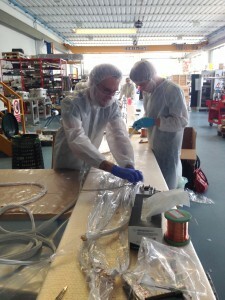 This work has been done by technicians and students from Nikhef and LNGS. 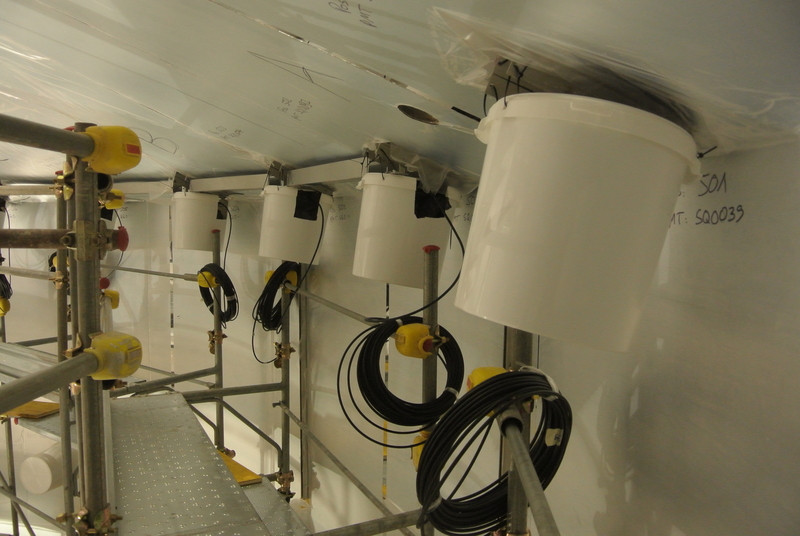 This entry was posted in Experiment and tagged construction, Support structure, water tank, XENON1T on May 21, 2014 by Sander Breur. 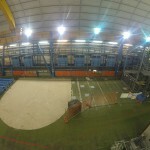 Construction of the XENON1T water tank: The floor in Hall B is prepared with self-leveling concrete. 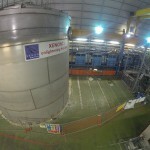 Image: Roberto Corrieri/XENON. 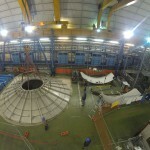 Construction of the XENON1T water tank: The roof of the tank is built first. Image: Roberto Corrieri/XENON. 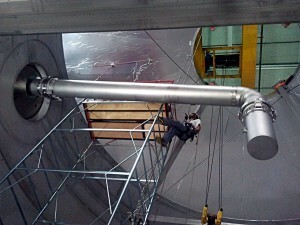 Construction of the XENON1T water tank: The safety rail and stiffeners on top of the water tank are welded in place. Image: Roberto Corrieri/XENON. 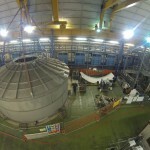 Construction of the XENON1T water tank: The first ring is welded below the roof. Image: Roberto Corrieri/XENON. 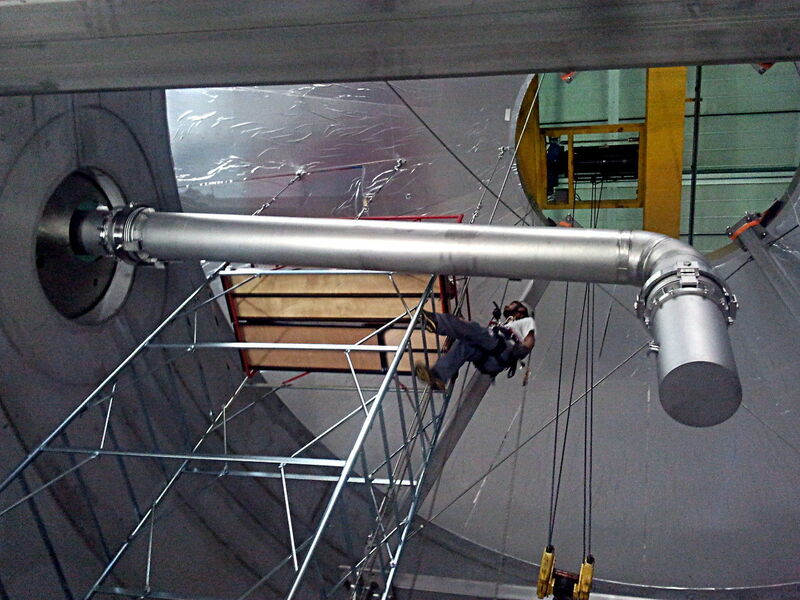 Construction of the XENON1T water tank: As the large crane lifts the roof up, the second ring is welded on. Image: Roberto Corrieri/XENON. 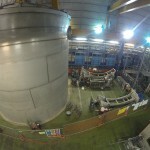 Construction of the XENON1T water tank: Ways to go… Ring 3 is welded. 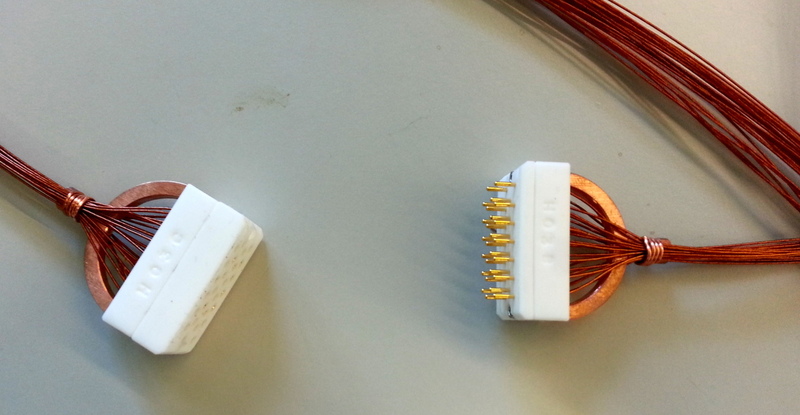 Image: Roberto Corrieri/XENON. 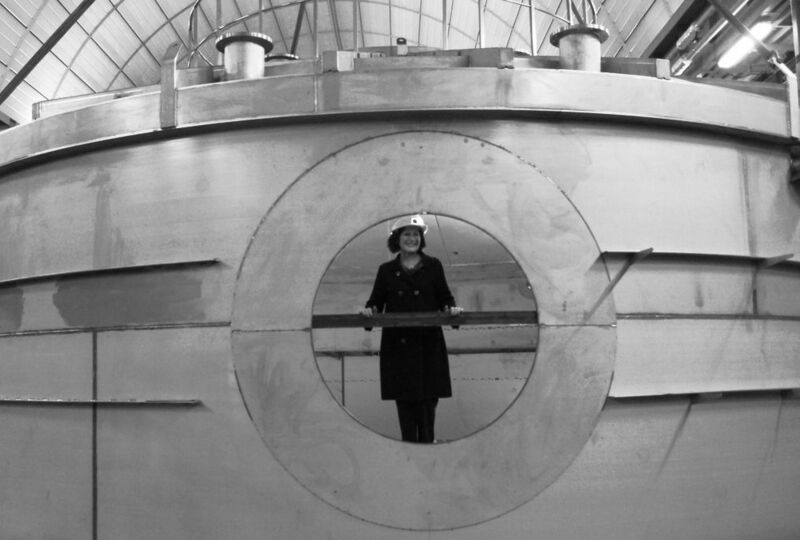 Construction of the XENON1T water tank: Ring 4… Due to its corrosion resistance and its low radioactivity, the whole tank is made from specially selected stainless steel. 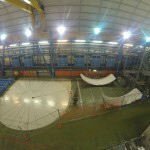 Image: Roberto Corrieri/XENON. 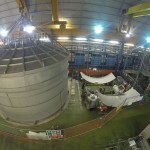 Construction of the XENON1T water tank: The last ring is welded on. Image: Roberto Corrieri/XENON. 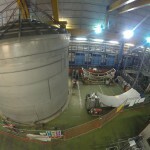 Construction of the XENON1T water tank: After welding the shell to the floor, the water tank is completed. Image: Roberto Corrieri/XENON. 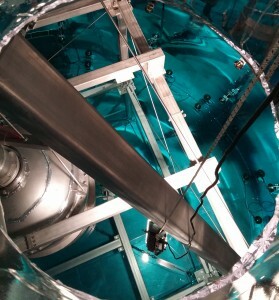 This entry was posted in Experiment and tagged 2013, construction, experiment, Gran Sasso, water tank, XENON1T on December 5, 2013 by Rafael Lang. All the xenon must somehow get to and from the detector through the water tank, as must signal and high voltage cables, various sensors, and we need large pipes to get a really good vacuum for cleaning the detector prior to filling. 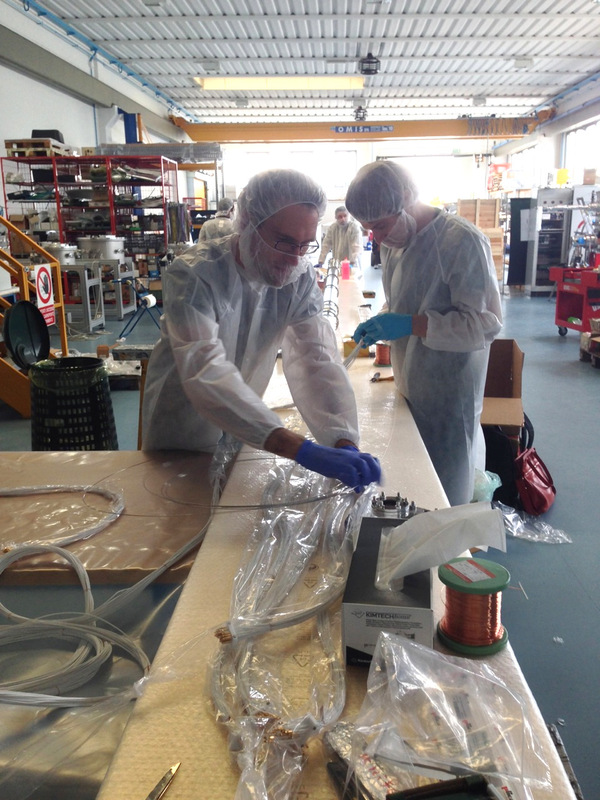 We use one large pipe for this lifeline of the detector, an aorta of sorts. Here is spokesperson Elena Aprile illustrating the huge scale of the XENON experiment. 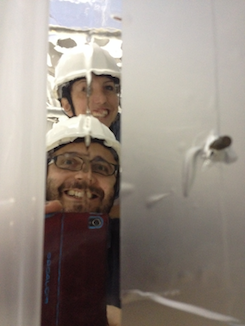 Spokesperson Elena Aprile behind the opening in the water tank through which all connections to the detector will be made. 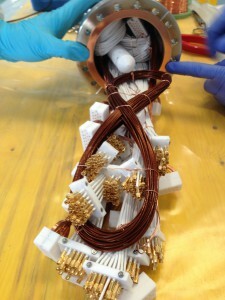 Picture credit: The XENON Collaboration. 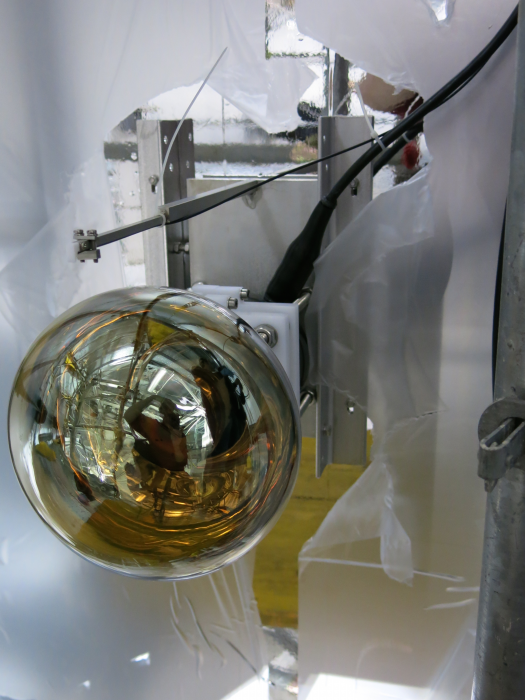 This entry was posted in Experiment and tagged 2013, construction, water tank, XENON1T on November 22, 2013 by Rafael Lang.